418 pages | 92 B/W Illus. 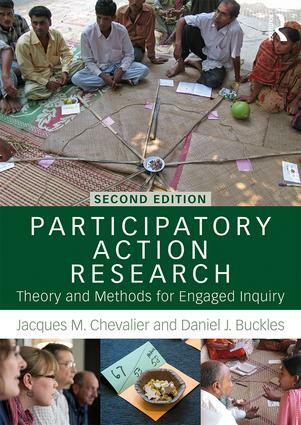 Fully revised and updated, this second edition of Participatory Action Research (PAR) provides new theoretical insights and many robust tools that will guide researchers, professionals and students from all disciplines through the process of conducting action research ‘with’ people rather than ‘for’ them or ‘about’ them. critical commentaries on major issues in the social sciences, including stakeholder theory, systems thinking, causal analysis, monitoring and evaluation, research ethics, risk assessment and social innovation. This modular textbook provides novel perspectives and ideas in a longstanding tradition that strives to reconnect science and the inquiry process with life in society. It provides coherent and critical treatment of core issues in the　ongoing evolution of PAR, making it suitable for a wide range of undergraduate and postgraduate courses. It is intended for use by researchers, students and working professionals seeking to improve or rethink their approach to co-creating knowledge and supporting action for the well-being of all. Jacques M. Chevalier is Chancellor's Professor Emeritus in the Department of Sociology and Anthropology at Carleton University, Ottawa, Canada, and an independent consultant. Daniel J. Buckles, formerly with the International Development Research Centre (IDRC), is Adjunct Research Professor in the Department of Sociology and Anthropology at Carleton University, Ottawa, Canada, and an independent consultant.